Last night, I finally tried out this design on the Cricut. It is similar to Stampin' Up! 's Top Note die. On the Cricut, I can make it any size I want. The trade off is that I lose some of the sharpness on the points. Next I decided to play with some of the stamps that jumped into my hands the last time I was in AC Moore. It is a really good thing that I live far enough away to only go there every couple of months. Last week I innocently went in to find some decorative paper like I'd used on Christmas cards last year. They didn't have it, but they did have two large box setes of stamps from Inkadinkado with 5 stamp sets in each box for $5.99 per box! Who could resist? The stamps are small. They would be great on enclosure cards, tags or as a little extra along with a regular stamp. Each box contained a greeting set and I always need words. In my sample I've used a bunch of those small stamps to create a single design. 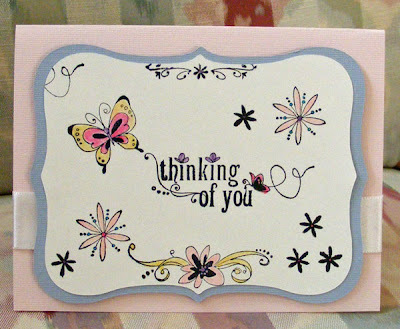 This card isn't my usual style but it is fun to do something different. I did enjoy my playtime and had a nice break from holiday cards. Watercolors: Rich Regals watercolor crayons from Stampin' Up!